So this is a project I've been working on lately, ripping one of the trophy models from Smash 4 in order to make my own custom Waluigi Amiibo. Now, originally, I was gonna paint it myself, but a buddy of mine offered to do it for me since I gave him a good deal on my BTAS/YJ figures awhile back. So I got in most of the Batman v Superman figures yesterday (I ordered Wonder Woman too, but she's coming separately) and I wanted to showcase them here. 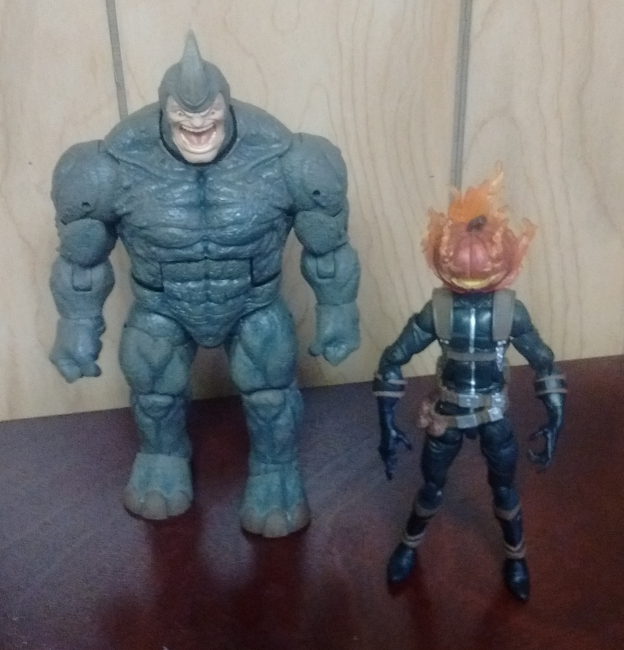 I have the previous movie figures in for comparison, and War Marchine because he was the first MCU figure I got my hands on. Overall, I'm really happy with them. 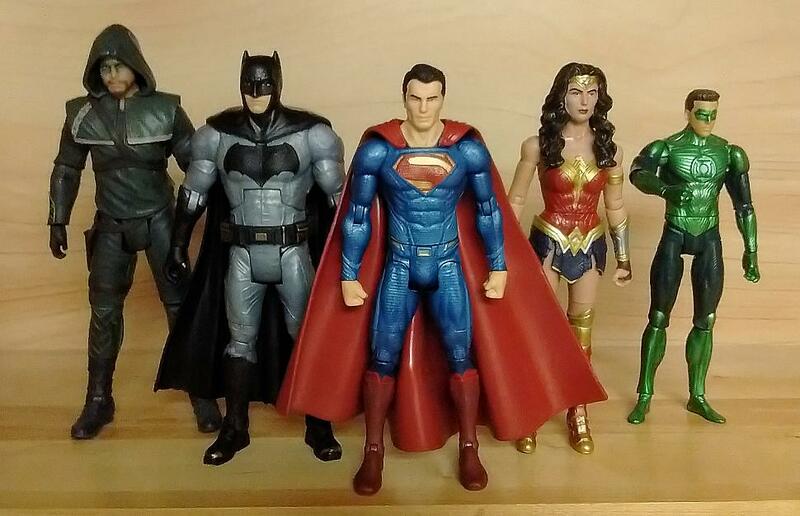 They're both larger figures then their predecessors (Batman obviously so, but even Superman stands a few cm taller than the previous Movie Masters figure) which is nice in placing them against the Marvel Legends figures, since now at least they don't look so embarrassingly short when standing next to their MCU counterparts. I also love that this line will also feature the Arrowverse characters, which gives me greater freedom to bolster the ranks against the much larger MCU. I did so previously with the DCC toys, but they were so much larger than even the Marvel Legends I had to hide them in the back. That said, a warning to fellow collectors: the figures I got, particularly Superman, had a fair amount of slop. That's always an issue ordering figures online, and it doesn't normally bother me, but Superman had some gold paint from the belt on his crotch. It was easy enough to scrape off, but yeah... it was not a good first impression. Still, the figures ARE much better made. As you can tell from the image, my previous Superman figure never really stood up correctly, and a lot of the other movie masters toys had similar issues. These figures though, they're 100% solid. I didn't even have to adjust them too much, they just stood upright out of the package. I don't call for tech support, I AM TECH SUPPORT! It's the internet, don't take it personal! Part of that might be how bad my phone camera is, for example the gold on Superman's belt isn't very noticeable in the picture, but it's very much so on the figure. Also the stupid red lines on the boots. That, and it could also be that the movie designs don't have that much going for them. I still say Superman should have more red. But I'm actually not sure which is the new Superman, left or right? The new one is the one that doesn't look like he'd fall over if blown on. 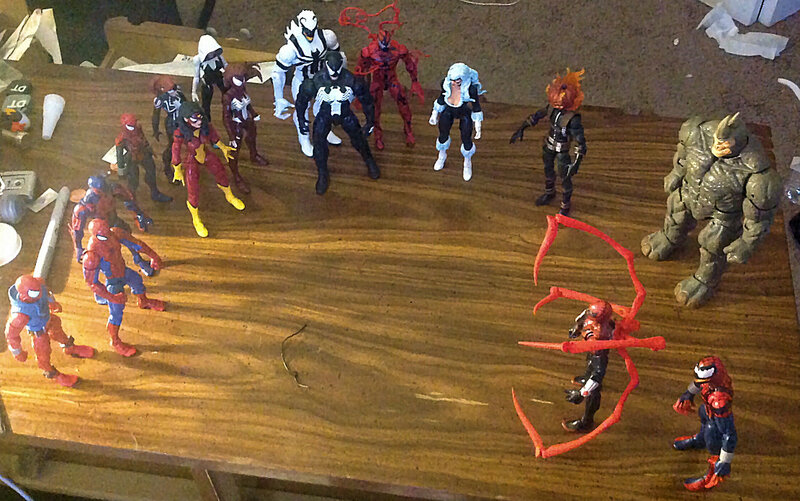 Anyway, not sure what I wanna do about the Arrowverse figures. On the one hand, I'd sort of like to expand the DC figures to match my growing collection of Marvel ones... but on the other, Flash is gonna have a film version soon enough, and the Green Arrow figure uses a design that is already outdated (Flash does too, technically, but I have white paint). In both cases they're more or less placeholders, and online prices (about $40 a pop) is a bit steep for that. I might feel differently if I see them in stores at regular price, but I may forgo them for the time being. Still... being able to group together Luthor and Reverse Flash? 'Mato likes. Got Wonder Woman in the mail today. You'll notice I got rid of the harness, as well as the sword and shield. I'm not a big accessories guy anyway, and I don't really feel like WW needs them. For this photo, I managed to dig out my Movie Masters Hal from the Green Lantern film (a film a lot of people give flack, but would have been a far greater start of a DC Cinematic Universe IMHO) and an Arrow figure from DCC. At this point, I don't see much of a point for either figure... I might keep Arrow as a placeholder until Mattel releases a proper "Green Arrow" from the latest season, but GL is so out of scale now that I'm better off just waiting for the inevitable DCEU figure. So for those not yet aware, I'm going to be moving down to Las Vegas soon, and one of the things I'm going to be doing there is participating in Let's Plays with my friends over at Double Take Las Vegas. Well, after seeing some LPs of Lego Dimensions, I discussed the game with my friends, and we decided that we could probably find some fun stuff to do with it for the channel, and since I kinda wanted to play it for myself anyway (I'm gonna be basically dungeon master for the channel playthrough) I've been the one buying the game and all the packs for it. My Lego dimensions packs so far. Minor update. 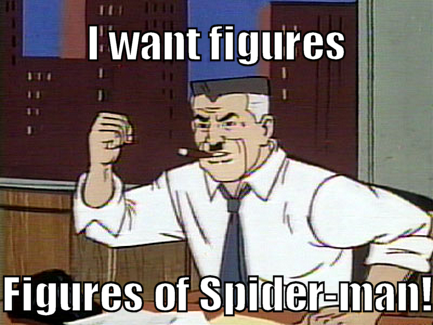 I've got more on the way (I bought Ock Spidey and the 3d prints I posted about, and I've ordered a custom Kaine and Iron Spider from a customizer who is doing some amazing Spider-Man work.) I want to follow up with some Spider-Women soon. That said, I'd be interested in seeing someone else's collection. HINT HINT Podmark. 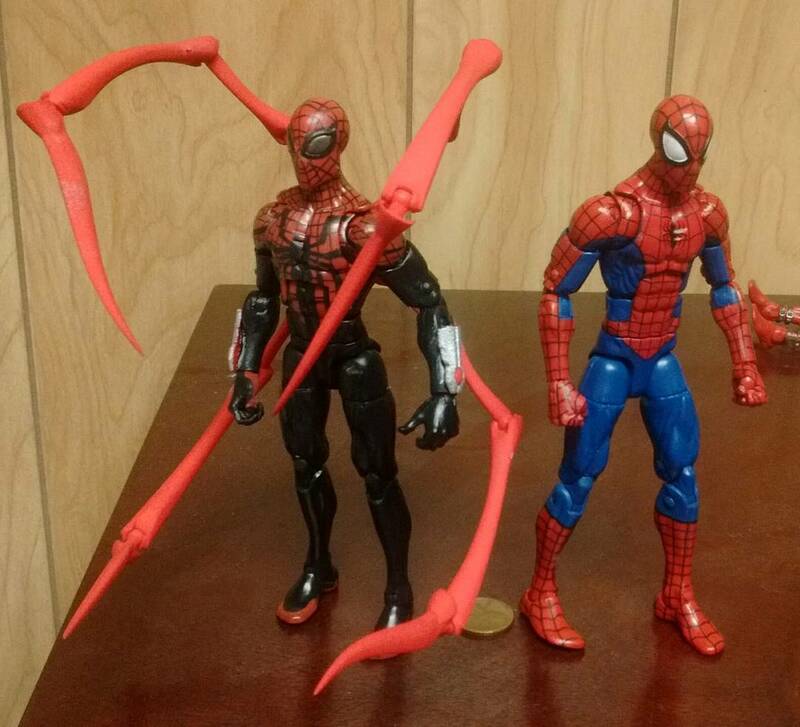 Now you just have to get the Black suit Spider-man and Miles and you'll be set! Miles is a must get, and as for black suit... I've discussed getting a custom Ultimate Black Suit Spidey with HDC when the new USM figures hit shelves later this year. 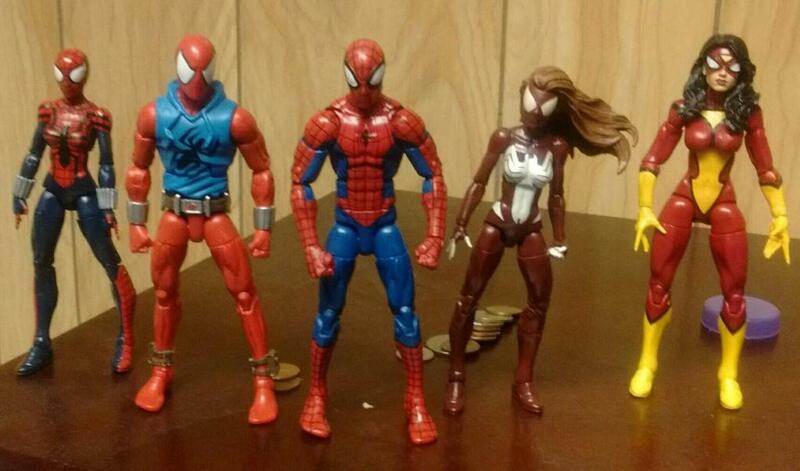 The next must have for me is Gwen, I just wish she was cheaper. If you insist...thought it's a lot of the same. If you were wondering about the rest of my collection, that would take some work. It's in random spots around my place, a lot of it in boxes. Got my legs in today (it took so long because Shapeways was offering $6 off in exchange for waiting a longer time period, which I'm fine with.) so I spent a good chunk of the afternoon working with the legs and... eh. Don't get me wrong, the design is awesome and he does fantastic work, but... the material was not what I was expecting. Instead of being red all the way through, it's basically painted red after printing... which is a problem when the model itself is built on sprues and the model is all red. It's not awful, but it required a bit of patching. Additionally, there was one joint in particular that existed purely to vex me... I just could NOT get it to go in on its own, so I ended up having to dremel a bit out of the joint to get it to pop into place. That having been said, the legs look and move fantastic. I was a little afraid to move them at all for the picture while I wait for the backpack to cement in place, thus why one of the lower legs is partly upside down, but the pieces themselves move well and hold position once popped in place. I also took the opportunity to repaint his eyes. Granted, the art for Superior Spider-Man's eyes are all over the place, but there is not a piece of artwork I've seen that went with BRONZE. I went back and forth before finally settling on a dark silver. I'm planning on touching up the paint in other areas once the backpack is more secure, but for now... Superior Spider-Man. Realized I hadn't updated in awhile, thought I would. 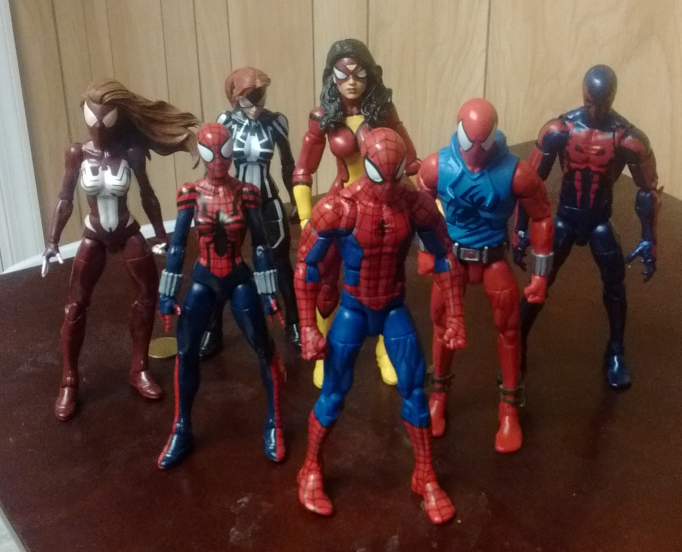 I ended up deciding to split up my Spider-Men into the "Amazing" and "Superior" teams like in the mobile game "Spider-Man Unlimited," with the "darker" Spider-Men on one side and the more heroic ones on the other. 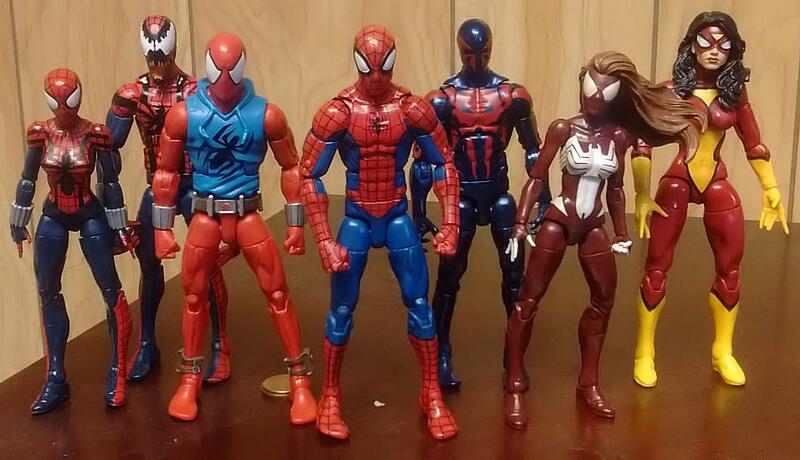 Of course, there's not many dark spider-men yet, but I'm planning on putting Iron Spider over there too, as well as Kaine... speaking of whom, the custom is apparently done already, the customizer sent me a phone camera shot, and it's pretty awesome. I'll cross-post pics of it when he sends me the professional ones. Already posted this on Instagram a minute ago, but this is probably the last update I'll be able to make before I finally move (yes, it is FINALLY happening. I've been going on about it for what, a year now?) both because all my spare money is going towards saving for the move, and because I'm gonna have to start packing everything up. This(and the Iron Spider figure) will probably be the last figures I get pre-move, if only because I actually paid for them a month or so ago. So after making a big deal about not buying any more figures and even turning down a very generous offer from Jeynyce for a spare Spider Gwen, I stumbled across Venom and Spider Gwen in my local target and ended up buying both. HRM. Love the Spidey stuff. The new comic ML Spidey and Rhino are absolute favorites for sure! 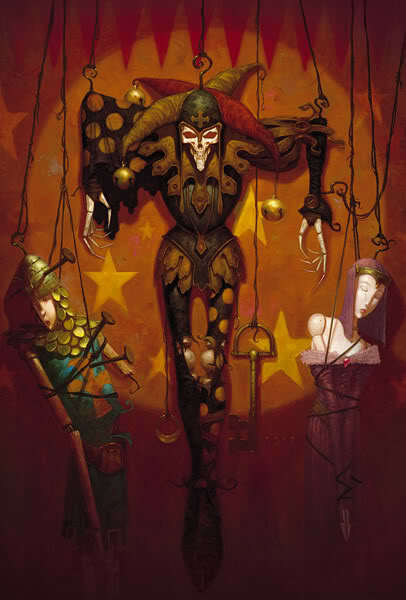 Avatar picture originally a Brom painting entitled Marionette. I'm sure he can find a bottle of Pepe Lopez tequila to soak it in. The Best There Is At What I Do......when I have the time. Tequila?!?! YUCK!! I don't drink that crap!!! Finally got back on firm financial footing again, so of course I'm buying more toys, duh. 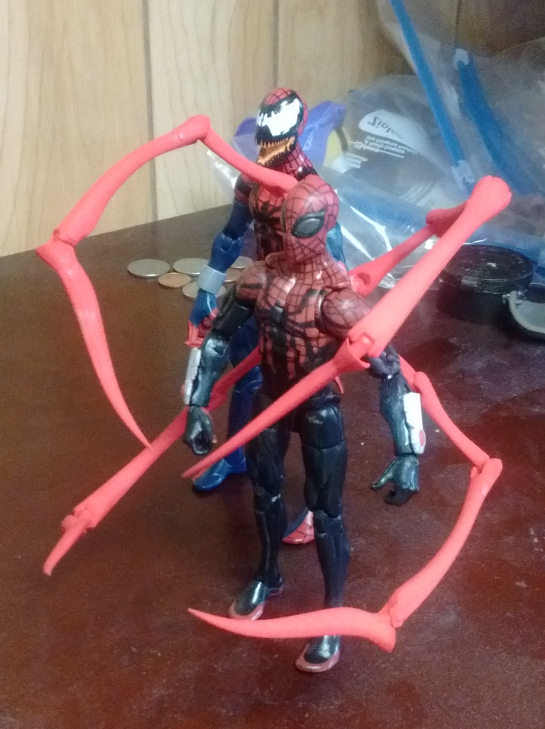 In all seriousness though, I splurged a bit and got the entirety of the Marvel Legends Infinite Series Spider-Man: Space Knight Venom wave, as it's the first wave where I'm totally ok collecting every figure. And while I technically won't be using either USM1 or Silk in my "final" collection (Ultimate Peter Parker will be represented by the black suit counterpart, which I have put waaaaaay too much effort into to NOT do at this point, and Silk didn't make the cut amidst so many fantastic Spider-ladies.) they're still both wonderful figures, and hell, I can swap them out. That having been said, I *will* have a spare Ultimate Peter Parker (the box comes with two of each version of USM, and I'm using the spare Miles for Symbiote USM) so if anyone else wanted one you can PM me. Man I haven't been keeping up on the newer figures. Space Knight Venom is especially cool. You're going to have quite the collection, Tomato. Man, I am super looking forward to a couple gems too... on top of the Iron Spider and Kaine figures I ordered (which I still don't have... hrm) I've been testing different paint combinations for the last few months trying to find something I was happy with for Symbiote Suit USM... I am so happy with what I came up with. My only fear is doing all the white sections (not so much the eyes, but the symbol... ugh) but I also just found someone who sells spiderman themed decals on Etsy (specifically various different artist themed eyes and kits for the Future Foundation design) so I sent him an email about possibly selling me ones for the black suit.